GREETINGS COMIC LOVERS! SWORD OF TRUTH COMICS WILL LIVE UP TO ITS NAME AND HONESTY AND INTEGRITY WILL BE THE CORNERSTONES! I TRY TO GIVE YOU THE BEST DEAL, KEEP IT REAL! BROWSE, LOOK, MAKE OFFERS! I WORK WITH YOU! ADD ME TO YOUR FAVORITES LIST AND THANK YOU FOR LOOKING! KEY IMMORTAL HULK #4 First PRINT KEY SERIES HOT!!! MARVEL PREMIERE #19 KEY FIRST APPEARANCE ADVERTISEMENT FOR 1st WOLVERINE!! AVENGING SPIDER-MAN #10 2ND CAROL DANVERS AS CAPTAIN MARVEL KEY ISSUE ! VENOM #30 AWESOME COVER WRINKLES SEE THE PICS!! ORIGINAL STAR WARS #12 AWESOME SERIES NEW MOVIE COMING!! 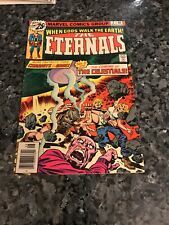 THE ETERNALS #2 FIRST APPEARANCE IF A CELESTIAL,AJAX AND ARISHEM THE JUDGE!! HOUSE OF M #1 SCARLET WITCH VARIANT SEVERAL CREASES! EXTREMELY RARE DARK MANSION OF FORBIDDEN LOVE #2 DC GIANT 48 Page COMIC!! RARE AQUAMAN #36 Awesome SILVER AGE COMIC SEE MY OTHERS!! ORIGINAL DETECTIVE COMICS #56FRONT AND BACK COVERS ONLY NO STORY SEE THE PICS!! MY LITTLE PONY:FRIENDSHIP IS MAGIC #1 FIRSTPRINT! RARE SPACE BLASTERS HAND HELD GAME USER'S MANUEL !!!!!!! MINIMATES BATTLE BEASTS DESMODIUS 2018 NEW YORK COMIC CON EXCLUSIVE!! RARE SUPER FRIENDS USED BIRTHDAY CARD VINTAGE FROM EARLY 1980s!! RARE 1990 NBA HOOPS 9 CARD UNCUT SHEET !!!!! RETURN OF TARZAN 1915 EDGAR RICE BURROUGHS! SONIC:MEGA DRIVE #1 2016 NEW YORK COMIC CON EXCLUSIVE ! DEADPOOL KILLS THE MARVEL UNIVERSE TRADE PAPER BACK COMPLETE STORY 1ST PRINT! BATMAN #177 SEE MY OTHER SILVER AGE COMICS !! TEENAGE MUTANT NINJA TURTLES #63 Rare RHODE ISLAND COMIC CON ! RARE SET OF MARVEL'S FUN AND GAMES #3,4,7,8 LOW PRINT RUN HARD TO FIND!!! WONDER WOMAN #189 Wrinkled COVERS SEE MY SILVER/BRONZE AGE ONES!! HULK #12 KEY ISSUE FIRST FULL APPEARANCE OF DEVIL HULK CREASES SND BENDS! DEFENDERS #1 ORIGINAL BRONZE AGE COMIC!!! TV SHOW COMING!!! EXTREMELY RARE SET OF 2 DRAGON BALLZ PROMO CARDS CREASES! POCKET SIZED EDITION OF ROBINSON CRUSOE FROM 1923 !!! THE YALE SHAKESPHERE: KING LEAR 1918 EDITION !!! GUARDIANS OF THE GALAXY #10 HARD TO FIND GREAT GIFT! BIG BIG STORY BOOK FROM 1938 BROTHERS GRIM AND OTHERS!! CIVIL WAR II #3 RARE SAN DIEGO COMIC CON EXCLUSIVE!! RICK & MORTY: POCKET LIKE YOU STOLE IT #1 NEW YORK COMIC CON VARIANT!!! AMAZING SPIDER-MAN #162 1ST APPEARANCE OF JIGSAW PUNISHER VILLAIN!! TEENAGE MUTANT NINJA TURTLES #9 ORIGINAL 1ST PRINT!! CARTOON NETWORK PRESENTS..SPACE GHOST COAST TO COAST #12 RARE NEWSSTAND VARIANT! G.I.JOE #8 RARE DIGEST SIZED ISSUE ORIGINAL SERIES RARE SILENT ISSUE!!! G.I.JOE #147 LOW PRINT SUPER HARD TO FIND NEWSTAND VARIANT !!!! !